Below is a list of all the possible Insignia Bonuses in Neverwinter, and the mounts you get them from. Some of the bonuses are listed more than once as they fit in several categories. 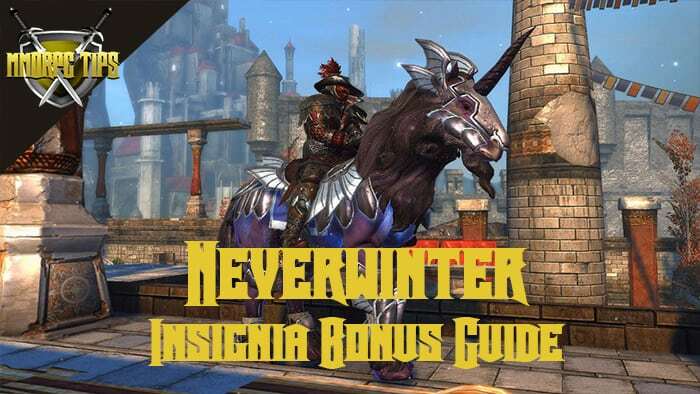 To find out wich Mounts and Mount Bonuses are good for your class, check out out Neverwinter Class Guides. These insignia bonuses are generally good for tanking and survivability. Survivor’s Blessing – 2 Crescent, 1 Barbed – Whenever you Deflect an attack, you are healed for 3% of your maximum Hit Points over 4 seconds. Vampire’s Craving – 2 Crescent, 1 Regal – Whenever you perform a Lifesteal, you are healed for 3% of your maximum Hit Points over 4 seconds. Slayer’s Redemption – 2 Crescent, 1 Enlightened – Whenever you kill a target, you are healed for 10% of your maximum Hit Points over 5 seconds. Oppressor’s Reprieve – 1 Crescent, 2 Illuminated – Whenever you are Stunned, Knocked, or Immobilized, you are healed for 4% of your maximum Hit Points over 4 seconds. Barbarian’s Revelry – 1 Crescent, 2 Enlightened – Whenever you perform a Critical Strike, you are healed for 1.5% of your maximum Hit Points. This effect can only occur once every 2 seconds. Protector’s Camaraderie – 2 Regal, 1 Barbed – Whenever your summoned Companion attacks, you gain 3% of your Power and Defense for 10 seconds. This effect can stack up to 4 times. Victim’s Preservation – 1 Crescent, 2 Barbed – Whenever you take greater than 35% of your Maximum Hit Points in pre-mitigated damage from a single blow, you are healed for 10% of your maximum Hit Points over 5 seconds. This effect can occur once every 10 seconds. Artificer’s Persuasion – 2 Barbed, 1 Illuminated – Whenever you use an Artifact power, your Recovery, Movement, Action Point Gain, and Stamina Gain are increased by 10% of your Power for 15 seconds. Champion’s Return – 1 Illuminated, 2 Enlightened – Whenever you are reduced to 50% Hit Points, you instantly recover 20% of your Stamina and are healed for 20% of your maximum Hit Points over 10 seconds. This effect can only occur once every 60 seconds. Cavalry’s Warning – 1 Crescent, 1 Barbed, 1 Enlightened – Whenever you activate a Mount Combat Power, you gain an increase of 10% to your Power, Recovery, Armor Penetration, Critical Strike, Defense, Deflection, Regeneration, and Life Steal. Shepherd’s Devotion – 1 Regal, 1 Barbed, 1 Illuminated – Whenever you use a Daily power, your teammates Defense, Deflection, and Movement are increased by 5% of your Power for 10 seconds. Gladiator’s Guile – 1 Regal, 1 Illuminated, 1 Enlightened – When your Stamina is above 75%, you move 15% faster. When your Stamina is below 25%, gain 15% of your Power as Stamina Gain. These insignia bonuses are generally good for doing damage. Combatant’s Maneuver – 2 Regal, 1 Illuminated – Whenever you control an enemy, you gain 5% Combat Advantage damage for 10 seconds. Warlord’s Inspiration – 2 Regal, 1 Enlightened – Your summoned Companion does 20% more damage. Alchemist’s Invigoration – 1 Regal, 2 Illuminated – Whenever you drink a Healing Potion, you are granted 5% more Power and Defense for 10 seconds. Magistrate’s Patience – 2 Barbed, 1 Enlightened – Whenever you perform a Critical Strike, your target will gain a stack of Magistrate’s Consideration. Enemies affected by Magistrate’s Consideration take Psychic Damage equal to 10% of your Power over 4 seconds. Allies affected by Magistrate’s Consideration are healed for 3% of your maximum Hit Points over 4 seconds. Berserker’s Rage – 1 Barbed, 2 Illuminated – While you have full Action Points, you gain 10% of your Armor Penetration as Power. Assassin’s Covenant – 1 Regal, 2 Enlightened – You lose 10% of your Defense, Deflection, and Life Steal, and gain the combination of lost stats as Power. Wanderer’s Fortune is a great bonus for anyone who still need to refine gear. Wanderer’s Fortune – 1 Crescent, 1 Regal, 1 Illuminated – You have a 4% chance after killing a foe to find a Refining Stone at your feet. These insignia bonuses are lesser versions of the ones listed above. These only require two insignias but for end-game you should aim for the three insignia ones. Vampire’s Thirst – 1 Crescent, 1 Regal – Whenever you perform a Lifesteal, you are healed for 1.2% of your maximum Hit Points over 4 seconds. Survivor’s Gift – 1 Crescent, 1 Barbed – Whenever you Deflect an attack, you are healed for 1.2% of your maximum Hit Points over 4 seconds. Oppressor’s Respite – 1 Crescent, 1 Illuminated – Whenever you are Stunned, Knocked, or Immobilized, you are healed for 1% of your maximum Hit Points over 4 seconds. Barbarian’s Delight – 1 Crescent, 1 Enlightened – Whenever you perform a Critical Strike, you are healed for 0.5% of your maximum Hit Points. This effect can only occur once every 2 seconds. Protector’s Friendship – 1 Regal, 1 Barbed – Whenever your summoned Companion attacks, you gain 1% of your Power and Defense for 10 seconds. This effect can stack up to 4 times. Warlord’s Encouragement – 1 Regal, 1 Enlightened – Your summoned Companion does 10% more damage. Alchemist’s Refresher – 1 Regal, 1 Illuminated – Whenever you drink a Healing Potion, you are granted 2% more Power and Defense for 10 seconds. Artificer’s Influence – 1 Barbed, 1 Illuminated – Whenever you use an Artifact power, your Recovery, Movement, Action Point Gain, and Stamina Gain are increased by 5% of your Power for 15 seconds. Magistrate’s Restraint – 1 Barbed, 1 Enlightened – Whenever you perform a Critical Strike, your target will gain a stack of Magistrate’s Consideration. Enemies affected by Magistrate’s Consideration take Psychic Damage equal to 10% of your Power over 4 seconds. Allies affected by Magistrate’s Consideration are healed for 3% of your maximum Hit Points over 4 seconds. Champion’s Struggle – 1 Illuminated, 1 Enlightened – Whenever you are reduced to 50% Hit Points, you instantly recover 10% of your Stamina and are healed for 10% of your maximum Hit Points over 10 seconds. This effect can only occur once every 60 seconds.